• Same proven design as out standard wheel chocks. • Under certain loading/unloading conditions, such as with tank cars, wheel chocks with steel spurs can sometimes get stuck under the wheel. No problem! 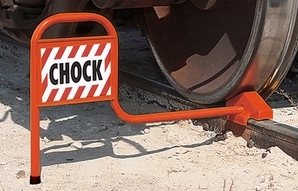 Aldon "Whack 'Em" chocks have reinforced steel handles that stand up to hammer blows or yanking the handles sideways.